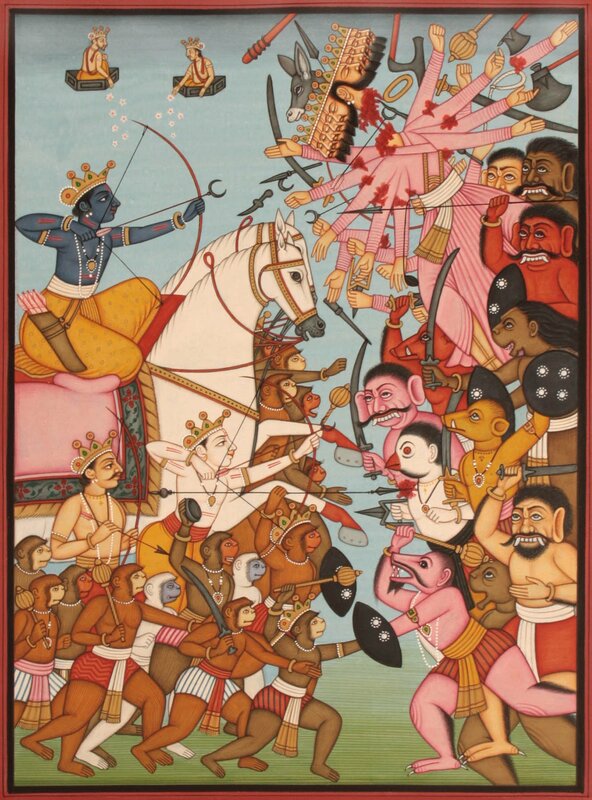 Obviously an episode – the war scene, for a rectangular format but represented on a vertical canvas with amazing thrust : the two warring sides queued so close confronting each other but with the same visual effect as it would have had when it was spread on a horizontal sheet of paper represents the climax of Rama’s Lanka mission : killing Ravana, Lanka’s demon chief, and freeing from his demonic hold apparently his consort Sita but in wider implication the earth that suffered under his impious rule. In mythical allegory Sita stood for the earth, Sita’s abduction, for forcibly grabbing control over the earth, and the incidence of killing Ravana and recovering Sita from his impious hold, for the restoration of the earth’s freedom and re-establishing the rule of Law and justice. Exceptionally dramatized, the miniature represents two sides, one led by Ravana himself and the other by Rama riding a chariot driven by two white stallions, quite composed but abounding in great pace almost as flying into air. The figure of Rama reveals great force with which he is shooting his arrows; with one of them he has already severed Ravana’s throat, and with some others, some of his arms, and his head composed of ten faces, as also his massive figure with twenty arms, is rolling down and is almost to fall on the earth. The artist has skillfully portrayed how from each of his twenty hands the weapons : swords, mace, battle-axe, bow, arrows, spear, goad, noose, knife, dagger … that he was carrying are slipping away. As the popular tradition has it, the artist has conceived Ravana’s apex with a donkey’s head which he had as the eleventh, perhaps symbolic of his donkey-like headlessness which reflected in taking confrontation with Rama. On his side are demon-warriors of both species, humanized and various animal breeds. Ravana’s figure is covered with a long pink gown though those of the demons on his side are in loincloths. Contrary to the established tradition as contained in the Valmiki Ramayana and the Tulsi’s Ramacharitamanasa, the blue-bodied Rama is riding a two-horses-driven chariot and is wearing, along with Lakshmana, his younger brother, Vibhishana, Ravana’s brother, Sugriva, Kishkindha’s monkey king, and Hanuman, gold crowns embedded with precious jewels, the symbols of regalia, as also a few ornaments. In literary tradition he is contended to have taken a vow, at the time when he was exiled or chose to spend fourteen years in forest, not to use anything, an ornament, vehicle, or even a costume as revealed to his princely status. After leaving Sumanta, Ayodhya’s minister, at the outskirt of Ayodhya he had been walking all through on foot and lived like ‘tapasas’ – ascetics, in the forest. Obviously, his ornaments’ wearing figure riding a chariot could be considered as against the vow that he had taken. Besides that a painter’s vision has to be essentially different from the poet’s his chariot-riding image is a mere dramatization of an essentiality contained in the literary tradition itself. Rama was shooting arrows after arrows at Ravana but every time he severed a head, there emerged another and Ravana was yet the same as before. Realising his Master’s dilemma Vibhishana revealed that Ravana contained around his groin nectar and unless that was destroyed Ravana could not be killed. From a normal human height whichever arrows Rama shot at Ravana’s mountain-like tall massive form could not target straight into the nectar-containing centre of groins. Vibhishana advised him to ride a chariot for gaining appropriate height. However, Rama did not agree; thereupon Hanuman lifted Rama on his shoulder to reach the required height and thus he was able to destroy the nectar that Ravana contained and finally killed him. The painter preferred a chariot to replace Hanuman’s shoulders, perhaps to let Hanuman free to fight his own part and out of his reverence for the regal status of Rama and others. When on war-front he preferred them to have their regal identity.